How Self-Care Is Changing My Life One Step At A Time! I am a working woman with a 4-year old kiddo. I have no time. If I’m not working, I’m with kid. If I’m with kid, I’m desperately getting back to work to deal with unfinished business. Little windows of time go in managing a home – damn, Surf is over again and the clothes are piling up. How people before and around and after me manage to do all three beautifully is perplexing for me. Laziness. Lots of it. After gathering motivation for aforesaid activities, doing “productive” or “purposeful” things is out of question. I’m no Rocky and “Eye of the Tiger” isn’t that effective after dealing with a 4-year-old all day. Forget eye of the tiger, I need some shut-eye. So, my new motto aptly called “Whatever!!! !” takes over. Yes, that word comes out loudly and rather forcefully. With chips, a wine glass and a frown. With exclamation points. It isn’t Pinterest-worthy anymore. It’s a mess. Clothes piled up and toys strewn around. Those pretty homes I see on Insta? Best left on Insta. But also, I thought, I’ll let go coz things are great in other depts. Home can suffer. It looks dangerously like I’m morphing slowly but surely into a crocodile. Post 30 life isn’t helping. Skin is dry like Gurgaon in summer ( I just moved there so you might see G-town refs left, right & centre). It’s got a life of it’s own and Hypothyroid is the outfit it wears nowadays. Yep, that explains the weight gain. And all the other things that come with it – Fatigue, Moody behaviour, definite dry skin, weight gain etc etc. I can deal with everything on this list except fatigue. It’s a nightmare. I don’t know for sure what my style was before I had a baby. It was electric maharani because I wore colourful outfits and went berserk. But now, my style is mainly “Wearing clean clothes – ironed ones, even better, spotless, I attained nirvana”. What? Do people have those anymore? I ate anything. It has to be food. My kid and husband fall in the same logic. Husband is tall and hardly needs exercise – he looks great. Metabolism dammit. Kid is eating healthy and good – with a side of fuss which is normal I guess. But we don’t know what’s good food for us? I am shamelessly addicted to Instagram. And reading quora. And other time-wasting things people set up so you click on the net. I hate click-bait, but I’m curious. So, basically sleeping at 1 am and waking up for my kids school at 6 am = chaos. And so, according to me these 7 were just not important. You see, I am a practical gal. I know there’s nothing called work-life balance. There is something called “Prioritising”. That means, you pick 3-4 things that most make you happy and make sure they are in a good place. So, my list goes: Baby – Husband – Job – Small Business. You could add Travel into this – I’m getting there but it’s still a fledgling. Rest, falls into the “whatever” box. I was content until last month. We moved to Gurgaon and I suddenly had to start afresh on things. And that’s when it got confusing. Who am I? A mom, wife, a decent employee and an okay-ish Entrepreneur ( for my sweet label Buttermilk). But who am I? But I knew I had to tackle the unimportant stuff to know the truth. My little windows need to accommodate things. So I shook up my space and let in some fresh air and started small. I’m still at the starting line. And in this journey, I discovered ideas and labels that made my life easier. So far, my apple cart is not lopsided so am guessing it’s ok.
Home needs a makeover. I did love some of the nicest stuff I bought at Urban Ladder and this little furniture market in Sector 56 where I bought crockery for as cheap as Rs 35. A good beginning. I also discovered that Amazon.in delivers some great coffee stirrers and this cute kitchen essential. Chumbak gave me new crockery like this cute green plate platter. I started reading up on my skin type and stopped buying cosmetics because I liked the packaging or the idea of it perpetrated by Fashion bloggers and ads. I realised that I need some Hydration in my life. A bit of Retinol. Maybe some Vitamin C goodness. All great (post coming up soon). 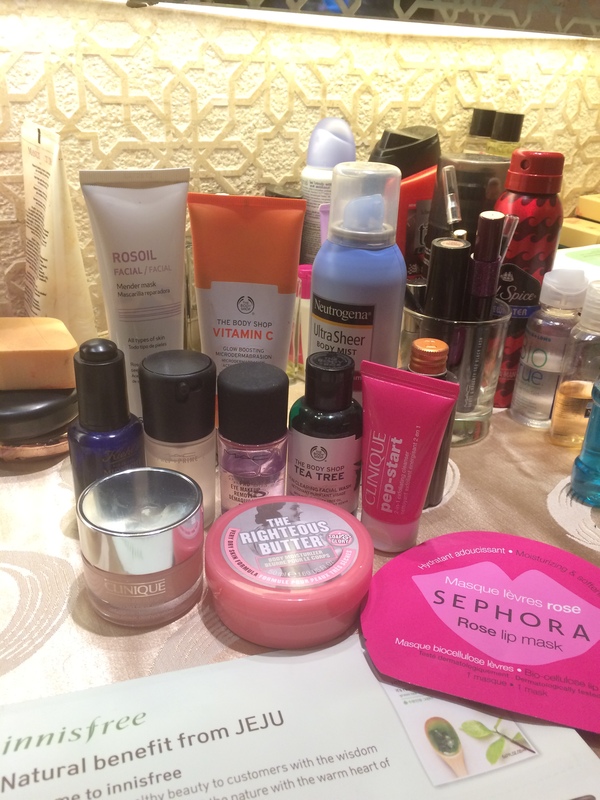 For starters: I started with this amazing Spanish facial mask called Rosoil (Rosehip oil #forthewin) and went ahead with a good skincare routine that included my current favourite Clinique Moisture Surge. Just got all my tests done. Started working out. Realised that Yoga + Body Pump with a healthy dose of strength training is what I figured I liked. I am still figuring out what fits me and makes me smile. But bags were my constant love these 4 years – my trusty Marc Jacobs bag. My hard-earned Ferragamo tote. An interesting cutie I bought on a sale at Koovs that makes for a great holiday bag. It was touted as THE vacay bag for women. NAHI! Does watching GoT fall in this category? WIP. Now here’s where I made a leap. I don’t have a cook because both my husband and kid eat in their office and school respectively. So that leaves me to deal with ONE MEAL. And I finally made a menu and bought some great things (All homegrown labels, I love that bit) – The Cambray Tiger Basa Fillet, Bacon Bits from La Carne. A kickass Epigamia breakfast – Jalapeno with barley puffs. And some nice Bananachip-infused chocolates from Daarzel. I made some great smoothies – Spinach, banana, chia, kiwi, almond milk was one helluva thing. I’m trying to eat mindfully because there’s temptation all around. I made a menu and I’m trying to stick to it. Hot Restaurant Alert: Shophouse Kylin and it’s chilli basil chicken bowl. H-E-A-V-E-N.
Getting into a routine of shutting eye by 10:30 pm. Tough, but switching off lights and looking up into the ceiling helps. I’m still wonky on that. Damn you, Insta Stories! And that’s really where I am now. Today. Nowhere close to perfection. But closer to sanity. I hope to keep my blog updated from now. Next Jean Paul Gaultier And His Sari Obsession Became My Obsession!